TEXARKANA, Texas – Texas A&M University-Texarkana and the Program for Learning And Community Engagement (PLACE) will host a lecture on October 31st by Courtney Hubbart, Adjunct Instructor of History at TAMUT. The talk is titled “She’s a Witch.” “Witchcraft Hysteria and Gender Bias in the Early Modern World,” and will take place from 12:00 p.m. – 1:00 p.m. in University Center Room 210. The event is free and open to the public. 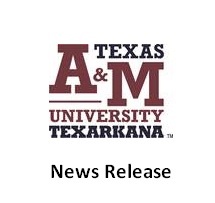 TEXARKANA, Texas – Texas A&M University-Texarkana will hold a press conference on Wednesday, October 31st to announce a significant donation to the A&M-Texarkana Foundation Endowed Scholarship Fund. The press conference will take place at 10:00 a.m. in the Eagle Lounge, located on the first floor of the University Center building. This donation will be matched as a part of the Double Your Impact campaign for the recently-announced TAMUT Foundation Endowed Scholarship. Please join us as we announce this generous gift and thank our community partner for such an impactful contribution to Texas A&M University-Texarkana.